Whether Boeing will find sufficient justification for developing the 797 -- at an estimated cost of $10 billion -- was a hot topic among customers and suppliers as the Air Show opened Monday. 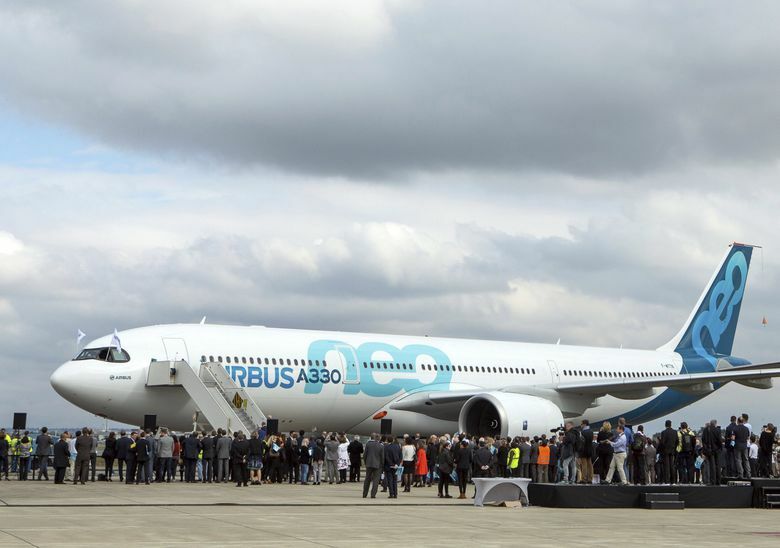 FARNBOROUGH, England — Boeing made a bold push this year to steal away a solid Airbus customer and deliver what would have been a stunning blow to the chances of Airbus’s latest new jet, the A330neo. Success could have seriously damaged sales of the already slow-selling Airbus jet, which would have widened the market for Boeing’s proposed New Mid-market Airplane (NMA), unofficially dubbed the 797. But Boeing’s effort to win over Malaysian low-cost carrier AirAsia seems to have failed, according to people familiar with the details. It’s not yet final, but a big Airbus order announcement is expected at the Farnborough Air Show near London this week. Whether Boeing will find sufficient justification for developing the 797 — at an estimated cost of $10 billion — was a hot topic among customers and suppliers as the Air Show opened Monday. If GE were to decide the market isn’t big enough, it won’t invest the roughly $2 billion required to develop a new engine. Whether or not Boeing goes forward with the 797 depends crucially on such calculations. The A330neo is part of the discussions of the market size for the NMA. Dómhnal Slattery, chief executive of major airplane lessor Avolon, a big customer of both Airbus and Boeing who manages a fleet of 900 aircraft, points to the Airbus jets that encroach at both sides of Boeing’s declared target market, with the A330neo at the high end and the top-selling single-aisle A321neo at the low end. Boeing’s NMA concept involves two related twin-aisle jets smaller than today’s widebodies, carrying 220 to 270 seats and flying about 5,000 nautical miles. The top-selling single-aisle Airbus A321neo, which has 206 seats and a range of 4,000 nautical miles, sits just below this proposed market. And the A330neo fits above it, carrying 287 passengers with a range of 6,550 nautical miles. Slattery is a believer in the A330neo. He has 34 on order and says sales will pick up within a few years as operators of current A330s begin to replace them with the new more efficient model. Slattery said he’s had extensive talks with Boeing on the NMA, and those continue. Lessors like him won’t buy any new jet model unless they see a big market for it, so that when planes come off lease there’ll be plenty of customers to take them. To strengthen its position Boeing’s sales effort targeted an A330neo sale at AirAsia, one of Airbus’s biggest customers, led by flamboyant chief executive Tony Fernandes. The airline’s long-haul affiliate AirAsiaX flies more than 30 current model A330s and has a firm order for 10 large A350s and 66 mid-size widebody A330neos. Fernandes is a large player in the Airbus success story. At the Paris Air Show in 2011, he turned a press conference announcing what was then the largest-ever Airbus order for 200 single-aisle A320neo jets into a boisterous show as he related a night of dancing in a bar with top Airbus executives after the deal was signed. So attempting to flip Fernandes was a bold move. According to the people with knowledge of the campaign, Fernandes was in the process of negotiating with Airbus to add more A330neos when Boeing tried to persuade him to cancel the order and instead take a great deal on 787-10s. Fernandes took a serious look. No doubt he used the leverage of a Boeing option in his negotiations with Airbus. But according to several accounts by people with knowledge, Airbus has turned it around at the last minute. An extension of the Airbus order with some added airplanes is expected as soon as this week. Gus Kelly, chief executive of AerCap, the world’s largest lessor with a fleet of more than 1,000 aircraft, owns more A330s than any other operator. He hasn’t ordered the A330neo yet, but he too is confident that in time many airlines flying the A330 will order it. “It might take a while, but it will come,” he said. Kelly’s analysis of the NMA is that there certainly is a market, but he added that Boeing’s challenge is to get the right balance between capability and price. So Boeing has to get all those parameters just right. He said if the NMA is launched, its immediate competition would be cheap, current-model A330s. Many airlines today often fly the A330 on routes averaging less than 2,000 miles, shorter than it was designed for. So an airline can rationally choose to fly a cheap A330 on short routes. And equally, a cheap A330 could be preferred to a shiny NMA if the price and capabilities of the all-new jet are not just right. Can Boeing close this tricky NMA business case? As Boeing ponders whether to pull the trigger on an NMA development program, GE’s David Joyce said emotion won’t come into it. “The drama of these programs and the mystique of these programs has to boil down to standing in front of a board and showing them the business case that they are going to give you the green light to invest in,” Joyce said.